Sunday December 11th, 2011 -SoundOnTheSound.com is hosting their 2012 fundraiser at the Columbia City Theater. The Seattle based music blog offers something very special- Producing vibrant high-quality video recordings of incredible musicians performing in intimate spaces (comparable to a site like YoursTru.ly in San Francisco). 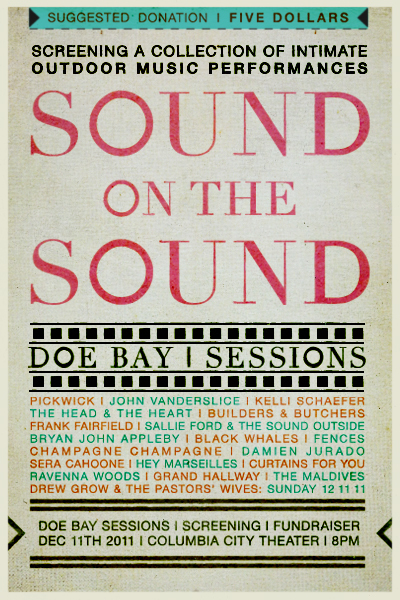 Every year during the Doe Bay Music Festival up on Orcas Island, Sound on the Sound brings their cameras along to record a series of acoustic performances on the gorgeous grounds of Doe Bay. Above we feature one of our favorite sessions from this series with (band of the moment) Pickwick playing two songs "Staged Names" and "Hacienda Motel". A site producing such tremendous sonic cinema truly deserves a grand place (Columbia City Theater) to showcase all of their hard work. Above Seattle Hip-Hop notables Champagne Champagne perform "Tropical Trina" and "Hollywood Shampoo". So stop down this Sunday to catch some of Sound on the Sound's favorite picks, along with new sessions viewed on the big screen. Plus, a few Doe Bay Session alumnus will be performing short sets to celebrate the event and to raise money to help film 2012's projects. For more info visit their site HERE. Cheers, FYM.